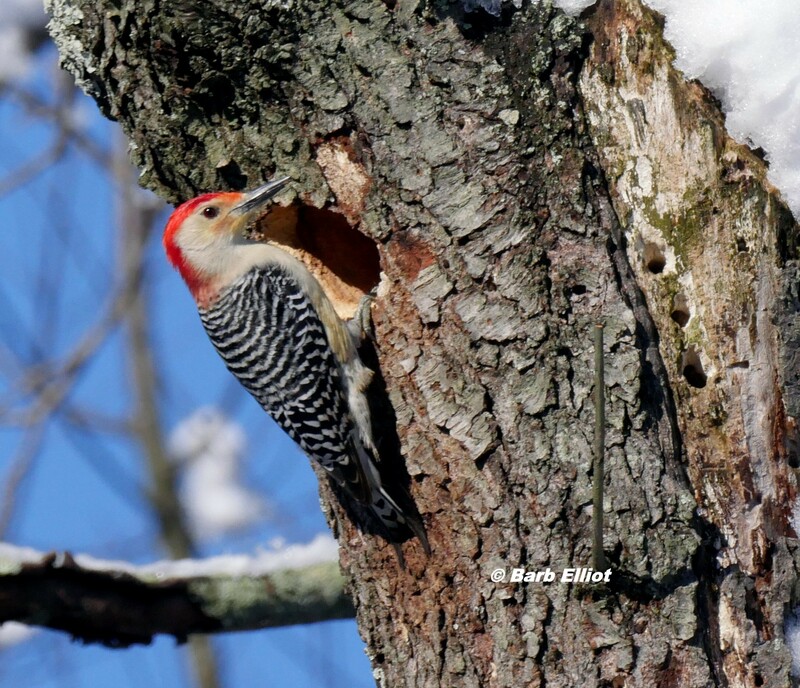 Provide food for wildlife by producing nutritious fruits, seeds, nuts, nectar, or pollen. Most host insects that are eaten by birds or other animals. 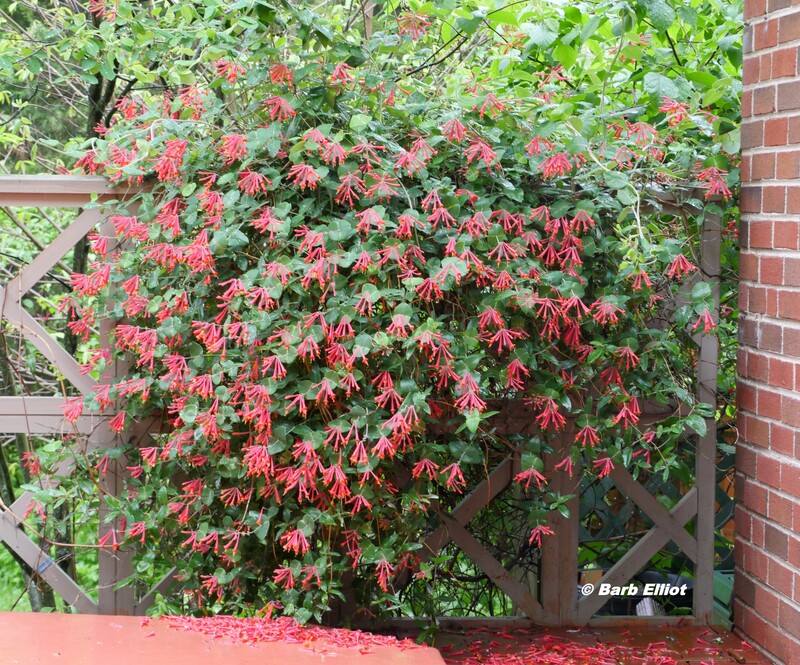 Easy to grow and make an attractive addition to your landscape. Sold at native plant nurseries and native plant sales. 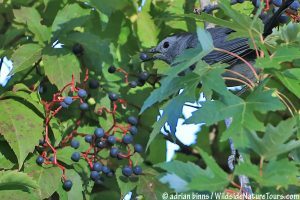 Spicebush berries are relished by migrating birds. Photo credit: Missouri Plants. Click to enlarge. 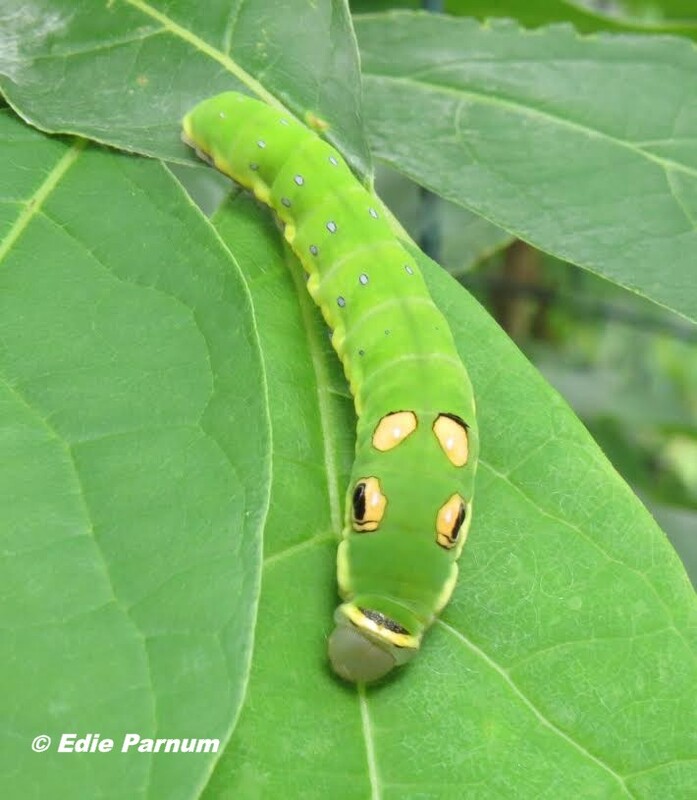 Spicebush is the host of this Spicebush Swallowtail caterpillar. © Edie Parnum. Click to enlarge. 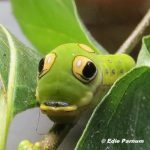 Spicebush Swallowtail Butterfly caterpillar. In fact, this caterpillar species is entirely dependent on Spicebush and its close relative, Sassafras, for its sustenance. Spicebush is also a host plant for Eastern Tiger Swallowtail and Promethea Moth. The flowers are pollinated by small native bees, wasps, beetles, and flies. 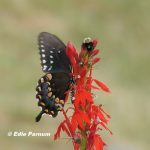 Spicebush Swallowtail butterfly nectaring on Cardinal Flower. © Edie Parnum. Click to enlarge. Growing Conditions: This fast-growing, disease-free shrub will thrive in a variety conditions from semi-sun to shade in average to moist soil. Its natural habitat is the understory of moist woodlands or woodland edge. 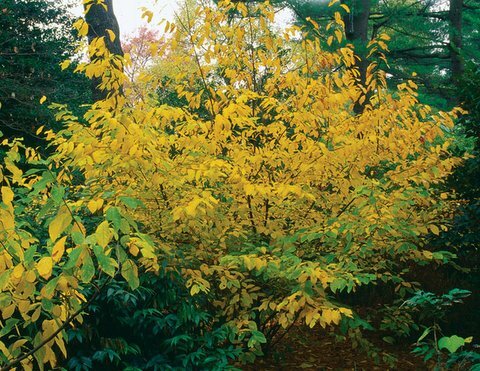 The leaves, twigs, and other plant parts are spicy when crushed, so deer don’t usually browse this shrub. 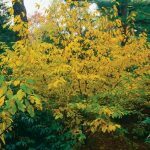 Spicebush showing fall foliage Photo: Sally Roth, FineGardening. Click to enlarge. Appearance: The Spicebush is a multi-stemmed 6-12’ deciduous shrub. Its blossoms appear in early spring before the foliage emerges. Although the flowers are small, they create a nice show of yellow haze when little else is blooming. Because this shrub is dioecious, male and female flowers occur on separate plants, and the berries form from female flowers. The fall foliage is yellow. 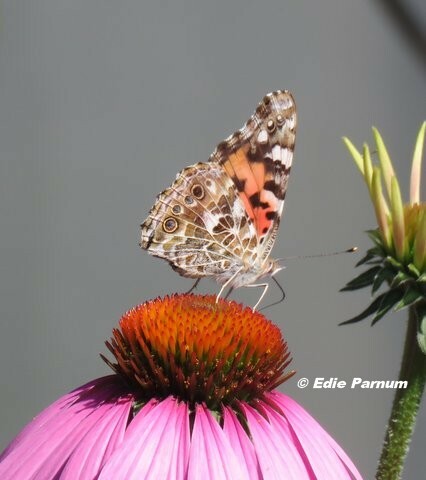 Painted Lady butterfly nectaring on Purple Coneflower. © Edie Parnum. Click to enlarge. 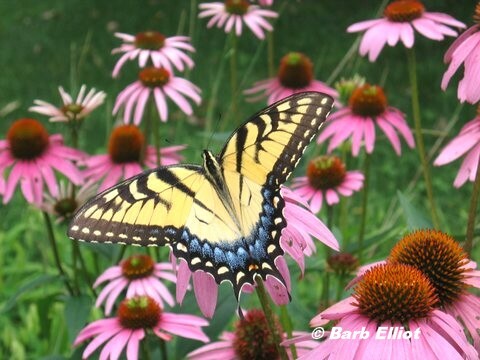 Eastern Tiger Swallowtail nectaring on Purple Coneflower. © Barb Elliot. Click to enlarge. with flower parts to avoid predators), Common Pug, and Sunflower Moth. In late summer and fall the coneflowers’ seeds are eaten by American Goldfinch and other finches. Cultivars of Purple Coneflower are frequently sold. 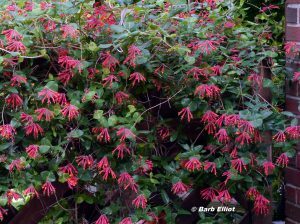 When purchasing plants, if possible, choose straight native species. Some cultivars selected by breeders change the shape or color of the flowers and possibly reduce the amount of pollen and nectar. For instance, Purple Coneflower ‘Pink Double Delight’ with its double flowers is less attractive to pollinators. Growing Conditions: This trouble-free perennial grows in moist to average soil with sun or part sun. It can survive heat and moderate draught drought conditions. Because it prefers lean, poor soil, fertilizer and other amendments are not recommended. The parent plant produces seedlings that can be easily transplanted. The roots of 3-4-year-old plants can be divided and transplanted, too. Normally, neither deer nor pests are a problem. Appearance: Purple Coneflower with its pinkish-purple flowerheads is one of our prettiest native perennials. It grows 3-4 feet tall on sturdy stems that do not require staking. This perennial blooms from July-September. Cutting back the spent flowers can extend the blooming period. Female Polyphemus Moth. © Edie Parnum. Click to enlarge. 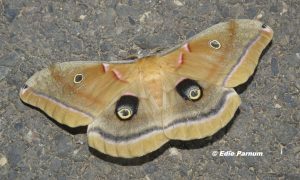 A Polyphemus moth alighted on my walkway. It was August 2016, and I had just moved to a retirement community. This cinnamon-colored giant silk moth had a wingspan of 4 1/2 inches. 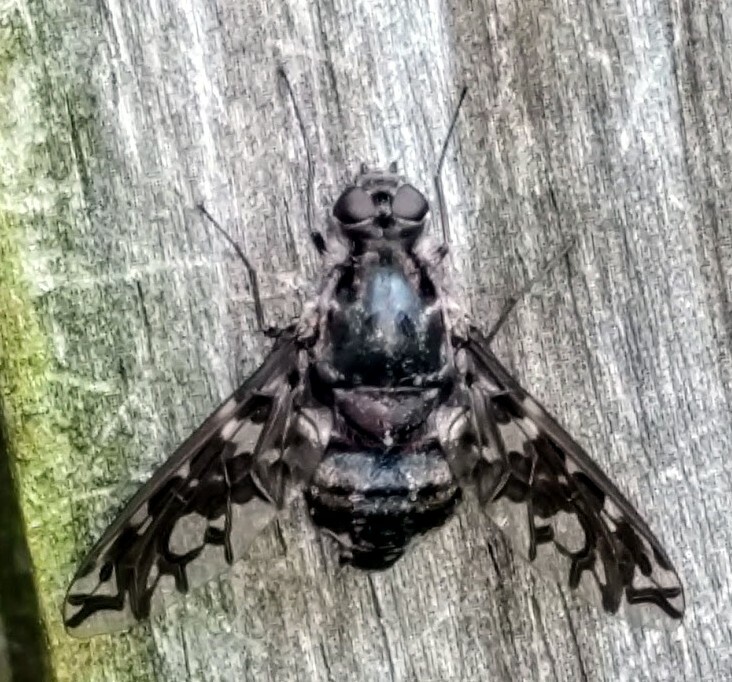 Each hind wing had a large eyespot highlighted with yellow and blue. It’s named for Polyphemus, the one-eyed Cyclops, who was blinded by Odysseus. 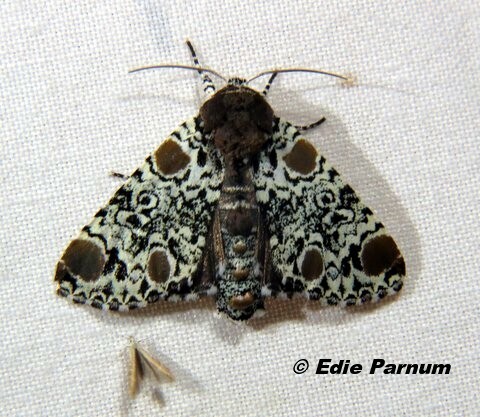 Although I’m a “moth-er”, I had never seen this handsome moth before. Polyphemus Moth caterpillar. Photo from Wikimedia Commons by MamaGeek. Click to enlarge. conference. They survived the 9-hour ride from southern Ohio. Once home, I fed them White Oak leaves from my community’s wooded area. 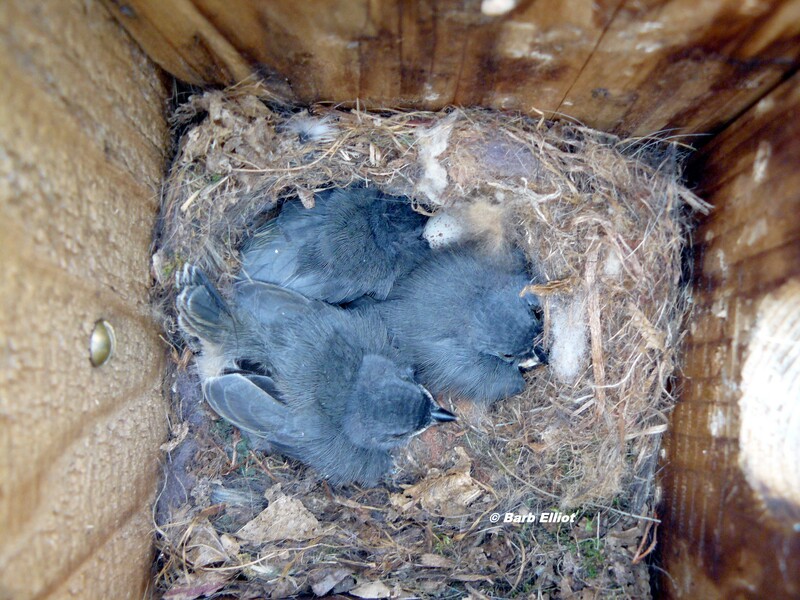 They ate voraciously and pooped continuously. (Scientists call the excrement frass.) Once or twice a day I cleaned out the mesh cage and supplied them with fresh leaves. After two weeks, they stopped eating and formed their cocoons. Twelve days later, a beautiful Polyphemus adult emerged. I knew she was a female because she had unfeathered antennae. Some friends and I released her at dusk. Antennae of male Polyphemus. © Barb Elliot. click to enlarge. Off she flew beaming out her pheromones to attract a mate. 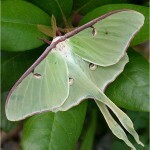 Two days later a male emerged from the second cocoon. We released him, too. Using his feathered antennae, he can “smell” a female’s pheromones from miles away. These two moths (or others of their species) will meet up and mate. They will not eat. Their sole job is to mate. 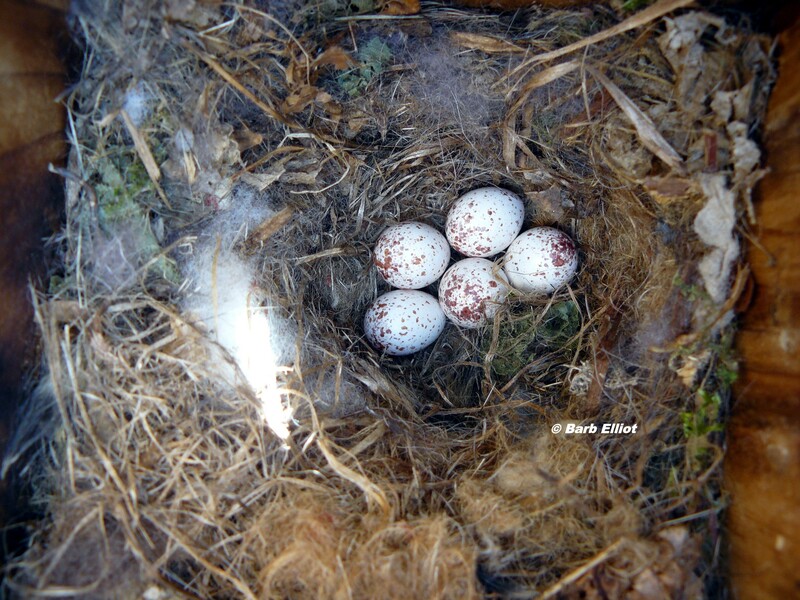 The fertilized female will lay her eggs on an oak, willow, maple, or birch. Her eggs will hatch and become caterpillars. Birds, mammals, and other insects will eat most of them. Miraculously, a few will survive. 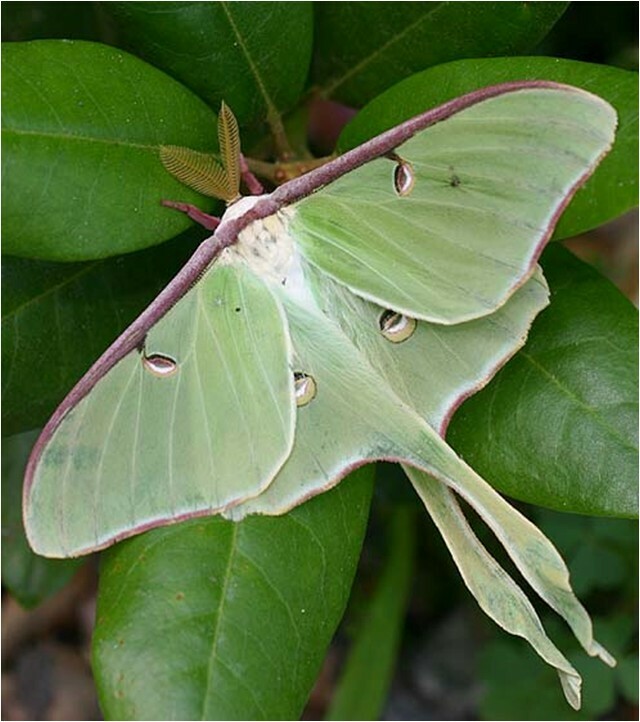 The cycle of life will continue—cocoon, adult moth, mating, egg laying, tiny caterpillars, big caterpillars, and cocoon again. 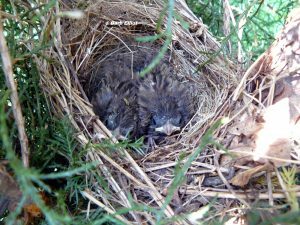 This will happen over and over, as long as we have wooded areas or yards with the essential native trees to support them. 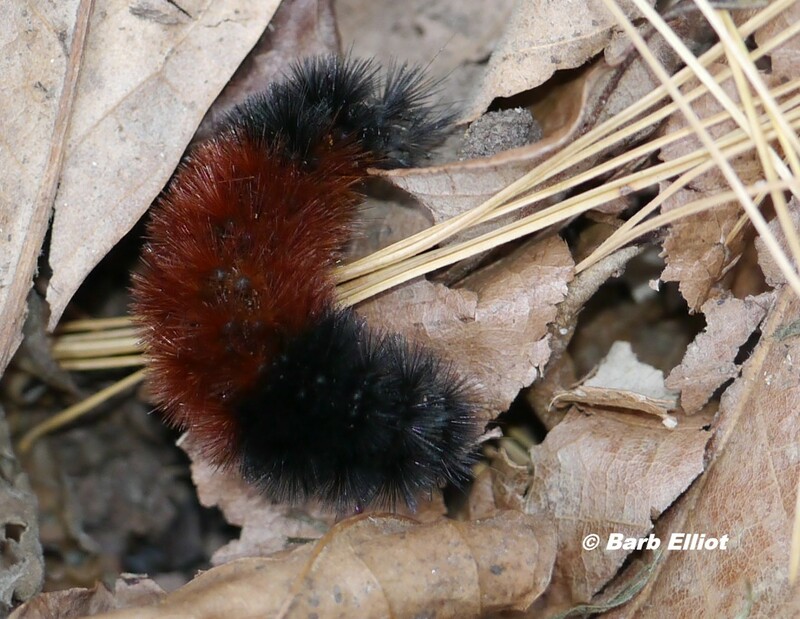 A Woolly Bear caterpillar looks for a place to spend the winter. © Barb Elliot. Click to enlarge. 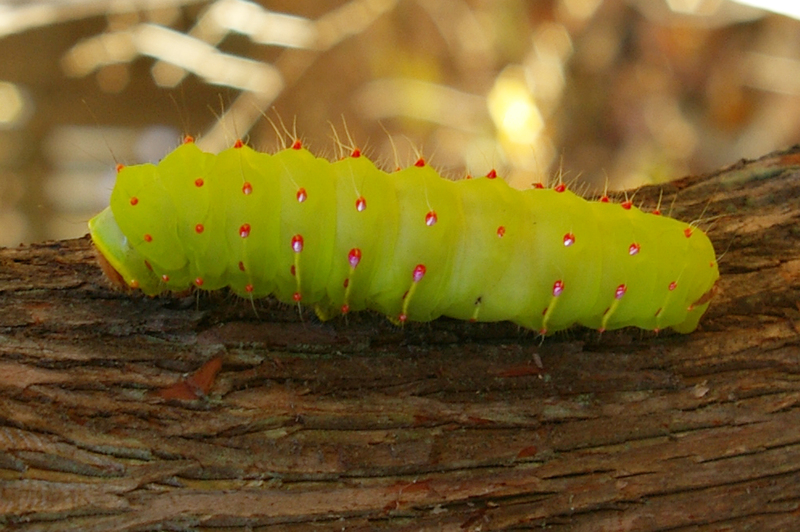 Fall can be a good time to look for Polyphemus and other caterpillars. 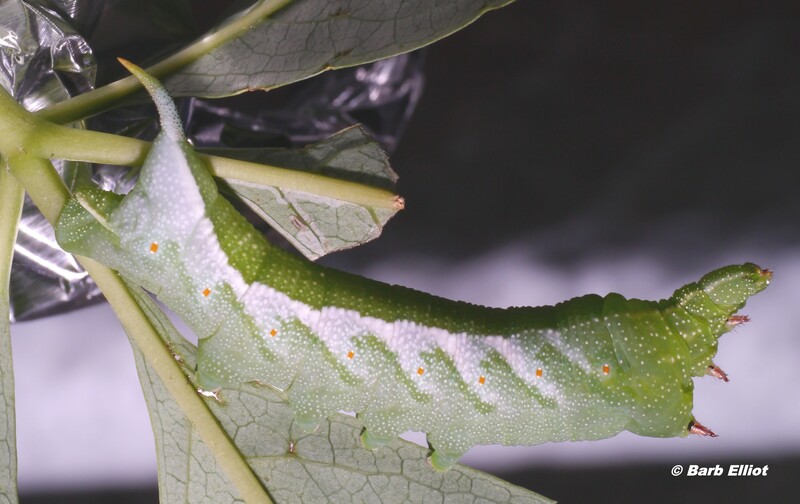 Many caterpillars leave the host plants where they’ve been feeding and start walking. These “wanderers” are looking for a suitable place to overwinter. 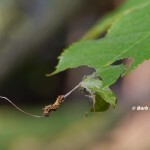 Many will spend the winter in leaves on the ground; others will spin a cocoon attached to a twig. Barb found this Polyphemus Moth cocoon in her yard. © Barb Elliot. Click to enlarge. 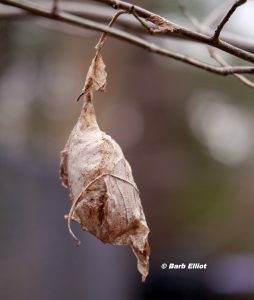 A Polyphemus moth cocoon could spend the winter in your own yard. Never mind the cold. 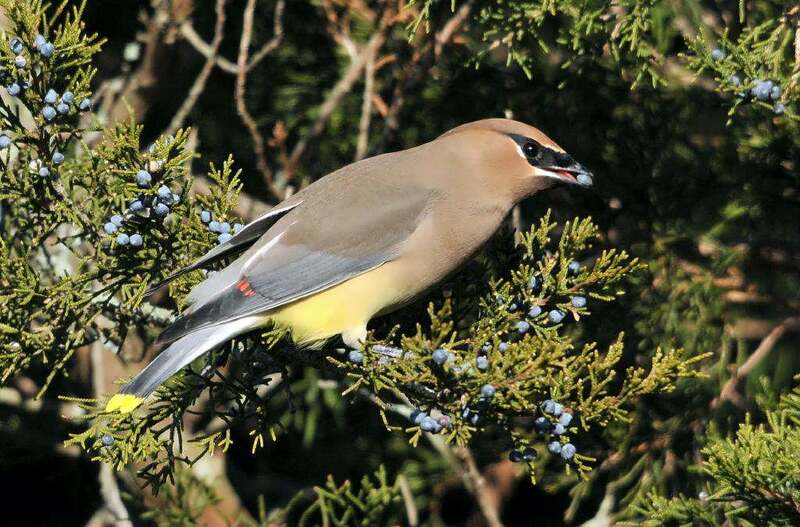 Go out into your yard and examine the bare branches of your native trees and shrubs. 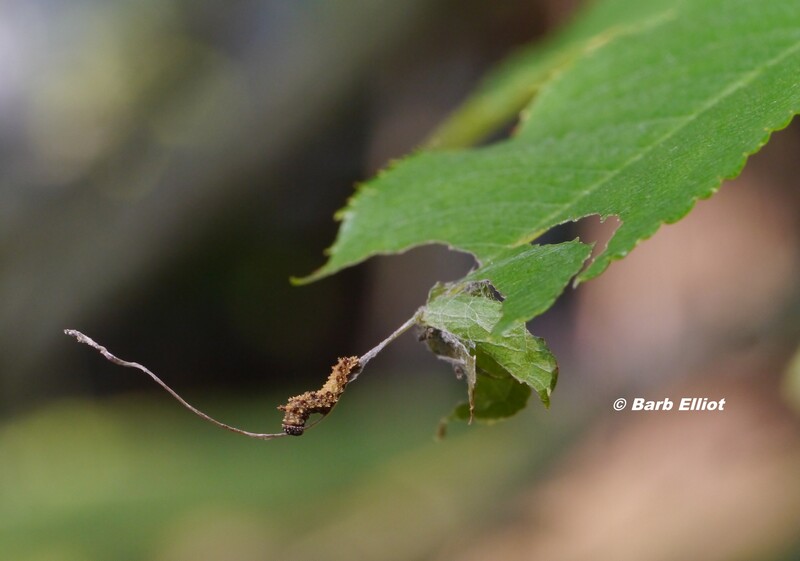 In 2012 Barb Elliot found a Polyphemus moth cocoon on a Spicebush twig. She told her story on our blog: http://backyardsfornature.org/?p=87, “A Magnificent Moth”. 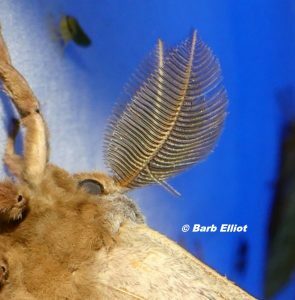 Maybe you, like Barb, can find a Polyphemus or other cocoon. 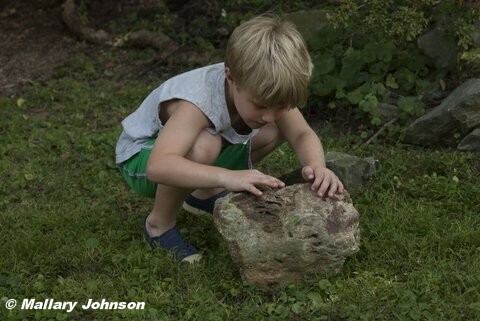 At all times of the year, we can look for signs of nature, both active and dormant, in our backyards. 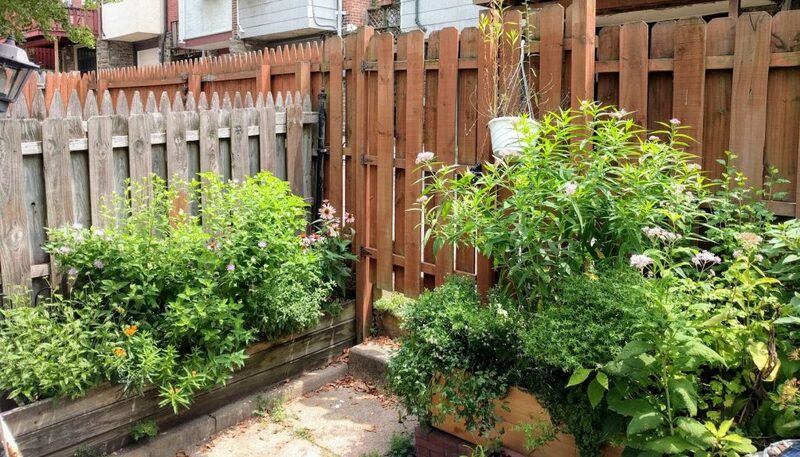 A 130-square foot cement-covered backyard —who would expect such a yard could be a haven for wildlife? The property is on a narrow street of rowhouses in Philadelphia. The nearest park is several miles away. Nonetheless, this garden is teeming with butterflies, bees, wasps, moths, and a host of other pollinating insects. A view of Navin’s small backyard. Photo by N. Sasikumar. Click to enlarge. Navin, an avid amateur naturalist, moved to this property last fall. He saw the potential to attract pollinators with native plants in raised beds and containers. 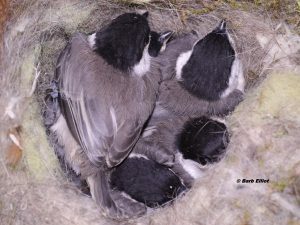 In early spring, he invited me for a Backyards for Nature consultation. Together we made a list of short and mid-sized perennials that bloom from early spring to late fall and are known to attract a variety of pollinators. He purchased good quality plants from Good Host Plants, a native plant nursery in Philadelphia. He planted perennials in two raised beds that sit atop the cement. Others he planted in large, deep containers. He installed two trellises for growing vines. 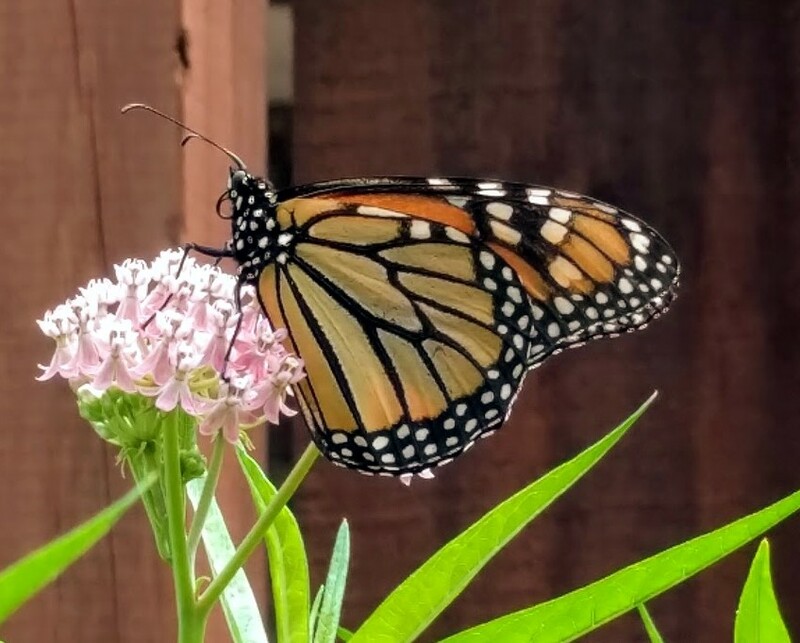 Female Monarch nectaring on Swamp Milkweed Photo by N Sasikumar. Cllick to enlarge. 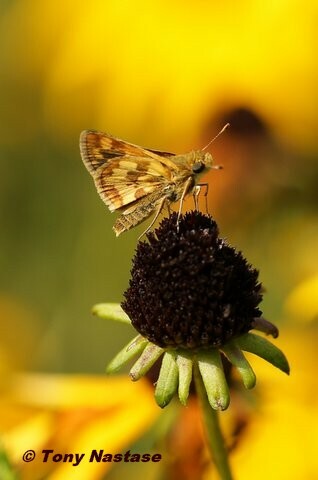 (Rudbeckia fulgida) host many butterflies and other pollinators. The show continues this fall with Grey Goldenrod (Solidago nemoralis), New England Aster (Symphotrichum novae-angliae), and other asters. Trumpet Honeysuckle (Lonicera sempervirens) and Virginia Creeper (Parthenocissus quinquifolia) will bloom on the trellises. 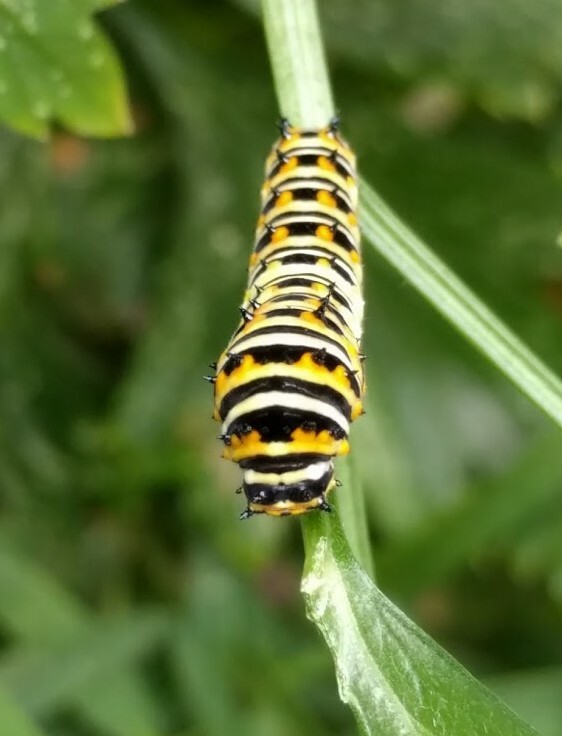 Black Swallowtail caterpillar. Photo by N Sasikumar. click to enlarge. garden. He discovered Monarchs laying eggs on his Swamp Milkweed. 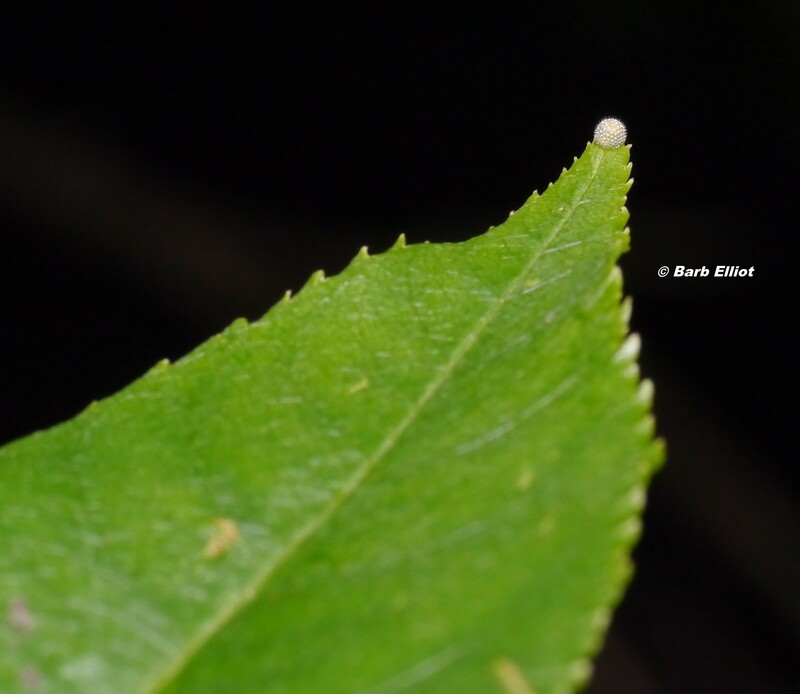 An insatiable predator, a Carolina Mantis (our native mantid species) lurked nearby, so he decided to bring the Monarch eggs and caterpillars inside to raise them in safety. So far, he’s raised and released 34 adult Monarchs. An additional 47 are either chrysalises or caterpillars and will be released soon for their journey to Mexico. He’s also rearing BlackSwallowtail eggs and caterpillars that grow on parsley. 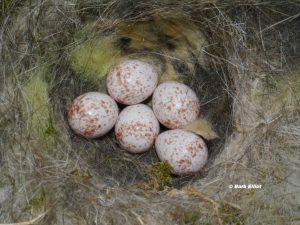 According to Navin, nighttime is the best time for spotting the small eggs and caterpillars. 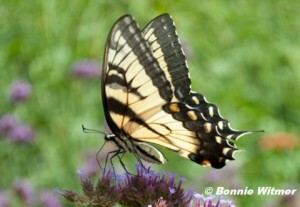 Giant Swallowtail. Photo by Barb Elliot. Click to enlarge. the Philadelphia area. Other insects are finding his garden, too. 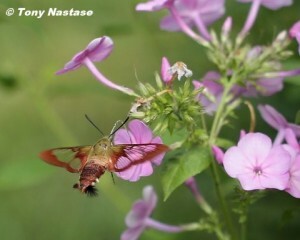 Navin observed a Snowberry Clearwing, a large day-flying moth, nectaring on blossoms like a hummingbird. A variety of bees, wasps, flies and moths feed on nectar and pollen. With so many insects, predators such as the Carolina mantis as well as spiders,lacewings, and parasitic wasps have located his yard, too. 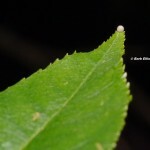 One day he spotted a lacewing eating aphids. Tiger Bee Fly, a parasite of carpenter bees. Photo by N Sasikumar. Click to enlarge. Navin offers advice to other wildlife gardeners with limited space. A great many plants can be crowded into small garden plots, raised beds, and large, deep containers. Prune the plants periodically to keep them short and use stakes before tall plants get floppy. Water frequently in hot weather. 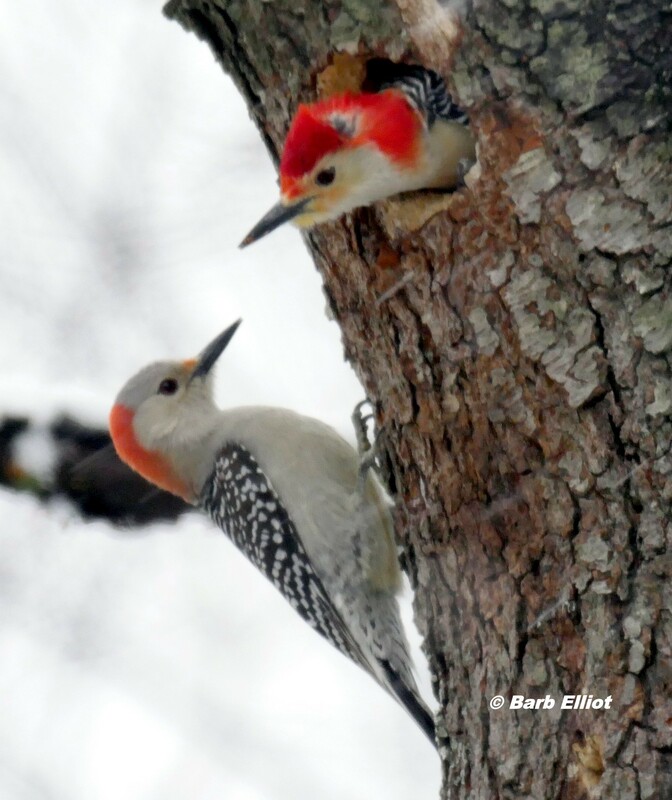 Navin submits his wildlife sightings to iNaturalist, a nature record-keeping app. 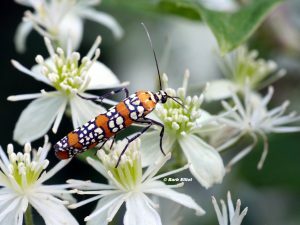 He photographs the butterflies and moths (both adults and caterpillars), bees, wasps, flies, beetles—in fact, any creature using his plants. 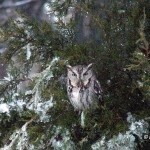 He uploads these photos and the species names to iNaturalist. The dates and location are automatically included. 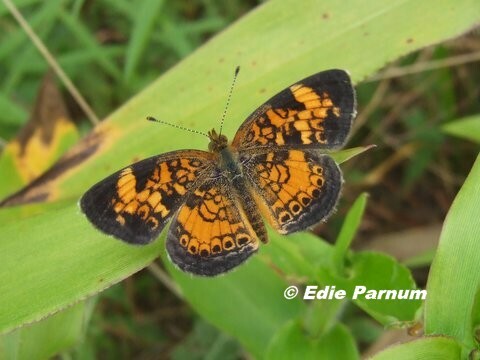 When the species is unknown, iNaturalist experts can usually provide the identification. 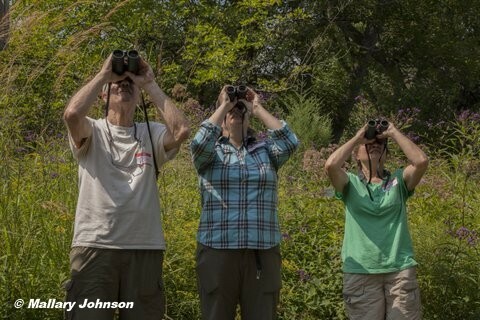 Scientists and other amateur naturalists can view and study Navin’s sightings and those of the other 137,000 iNaturalist users. How do so many creatures find this yard? Certainly, adult butterflies and moths can fly. They’re wired to find nectar and pollen for their survival. 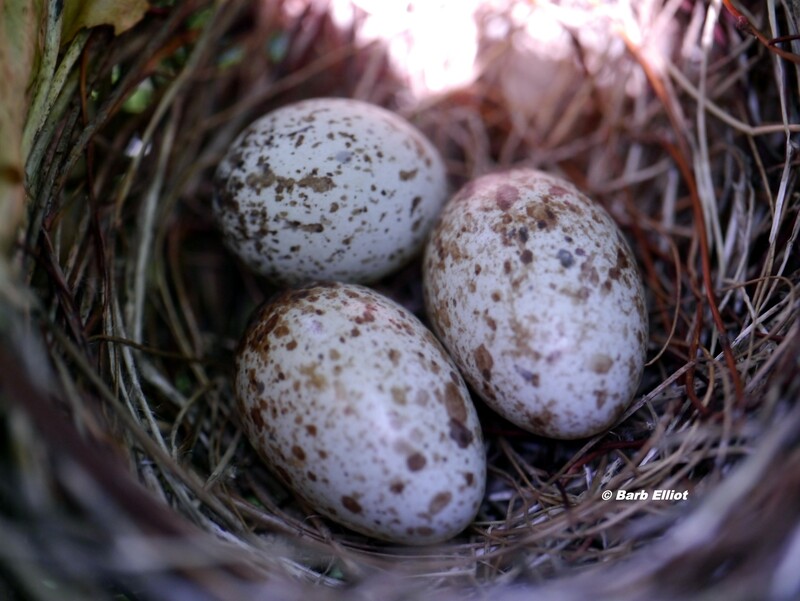 With their chemical sensors, they can also locate the specific plants they require to lay their eggs. Other insects have powerful search mechanisms, too. Navin will keep searching. He’ll find more creatures. After all, this garden is only 6 months old. 1. Native to southeastern Pennsylvania. 2. Offer high wildlife value and contribute significantly to your property’s web of life. 3. 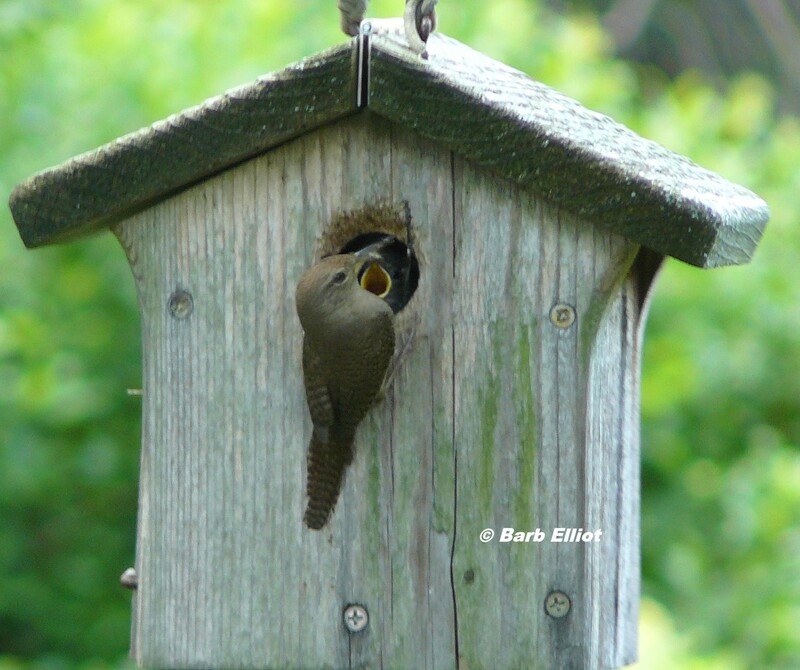 Provide food for wildlife by producing nutritious fruits, seeds, nuts, nectar, or pollen. Most host insects that are eaten by birds or other animals. 4. Offer shelter and places to raise young. 5. Easy to grow and make attractive additions to your landscape. 6. Sold at native plant nurseries and native plant sales. 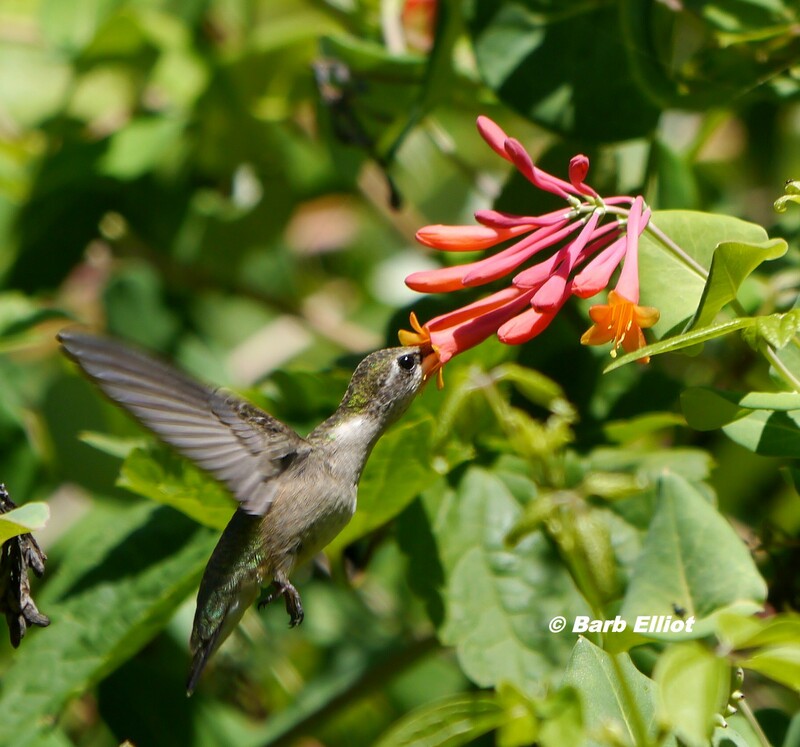 Female Ruby-throated Hummingbird feeds on Trumpet Honeysuckle nectar. © Barb Elliot. Click to enlarge. nourishes our Ruby-throated Hummingbirds. 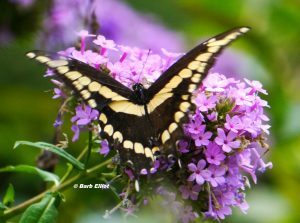 Butterflies and bumblebees use the nectar and pollen. 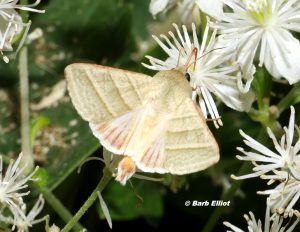 As with other native plants, the foliage is food for native caterpillars, including Spring Azure butterflies and moths such as Hummingbird Clearwing (Hemaris thysbe), Snowberry Clearwing (Hemaris diffinis), Harris’ Three-spot (Harrisimemna trisignata), and Great Tiger Moth (Arctia caja). These caterpillars in turn are food for birds and their nestlings. 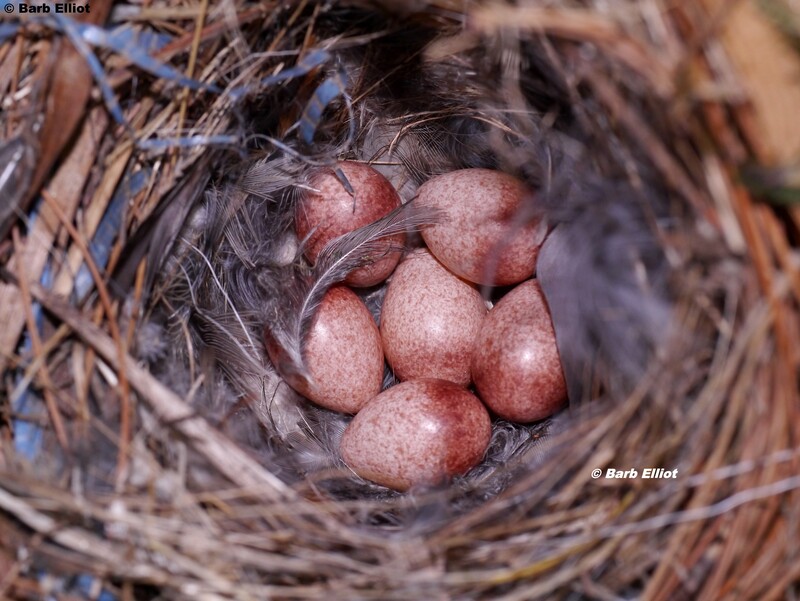 Songbirds occasionally eat the red berries. Trumpet Honeysuckle vine in full bloom. © Barb Elliot. Click to enlarge. 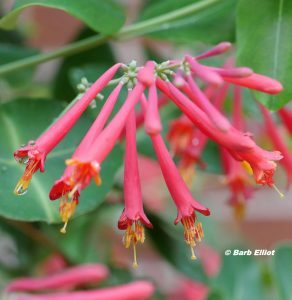 Growing Conditions: Trumpet Honeysuckle is adaptable to a variety of situations, sun or part sun, dry to moist soil. 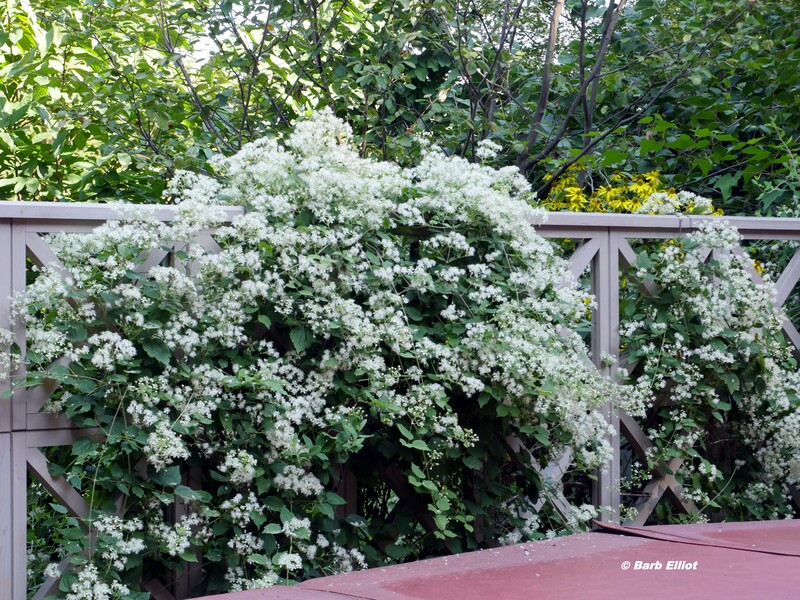 This twining vine is best supported by a trellis, fence, or arbor. The plant is long-lived and usually not bothered by pests or disease. Fertilizer is not recommended. 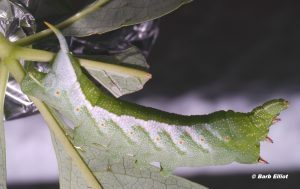 Harris’ Three Spot moth caterpillars eat honeysuckle leaves. © Edie Parnum. Click to enlarge. 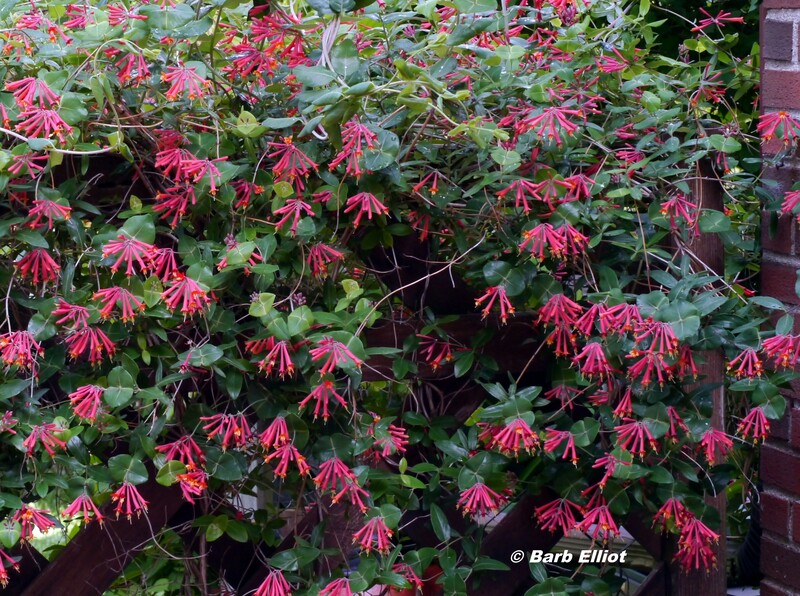 Appearance: This honeysuckle is a rapidly growing multi-stemmed vine but isn’t invasive. 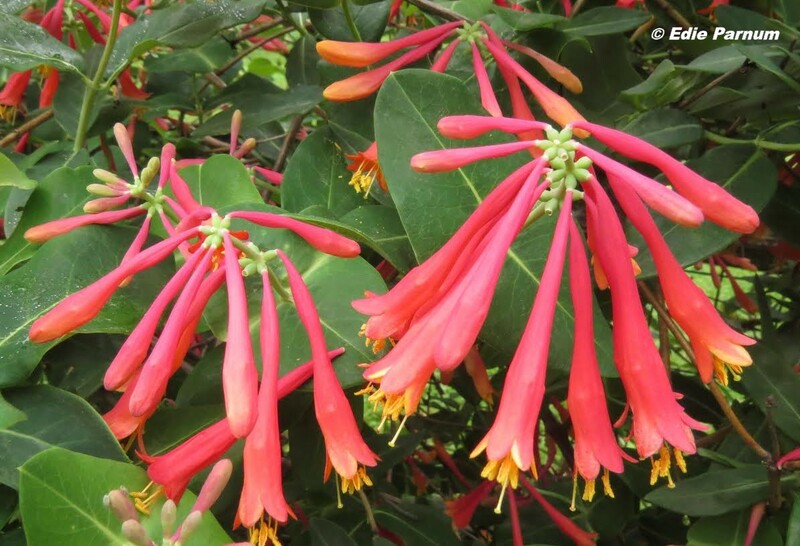 The attractive, clustered 2” tubular flowers are red with a yellow throat. They bloom, sometimes profusely, from May through late summer. New England Aster produces a profusion of attractive flowers. © Barb Elliot. Click to enlarge. 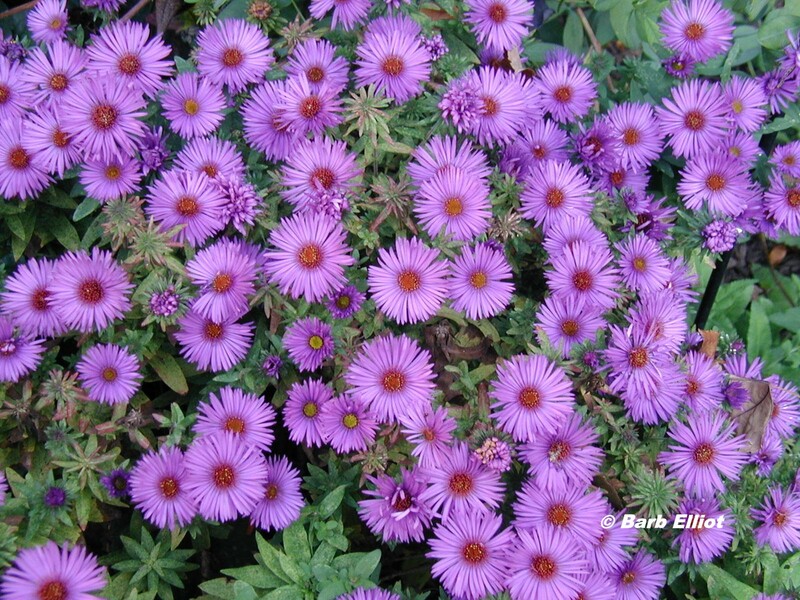 Aster flowers. Sweat bees, leafcutter bees, carpenter bees, mining bees, and bumble bees are attracted to the blooms’ bold, contrasting colors. The flowers are an important nectar source for Monarch butterflies during their fall migration. The foliage hosts 109 species of caterpillars (per Doug Tallamy, Bringing Nature Home: How You Can Sustain Wildlife with Native Plants, 2007) including the Pearl Crescent butterfly. 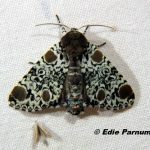 Moth species include Saddleback caterpillar, several geometers, and Brown-hooded Owlet. Growing Conditions: This trouble-free perennial grows in moist to average soil with sun or part sun. The parent plant produces seedlings that can be easily transplanted. 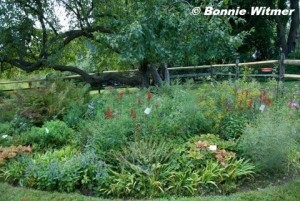 Mature plants can be divided and transplanted, too. Mildew can develop with high humidity and poor circulation. 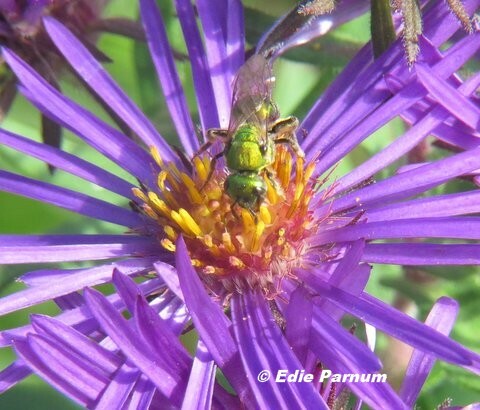 Sweat Bee (Augochlorell sp.) collects pollen. © Edie Parnum. Click to enlarge. of brightly colored blossoms, each 1 ½” across, appears in late summer and persists until fall. The flower rays are bright pink or purple, the central florets yellow-orange. The plant grows 3-6 feet high and may require staking. 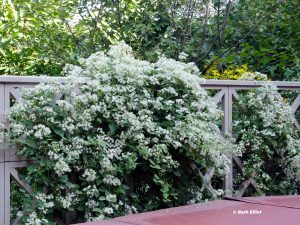 In a small garden, keep the plant from getting too tall by pinching back the top growth in early June and then again in early July. The flowers are attractive additions to flower arrangements. 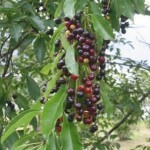 Cultivars are available in a variety of colors and heights. For eight years I have been gardening for nature on my ¾-acre suburban property. 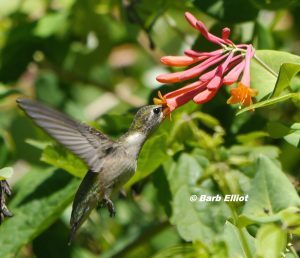 My yard with its abundance of native plants teems with birds, butterflies, bees, beetles, moths, and other creatures both big and small. On August 29 my property abounded with people, too. 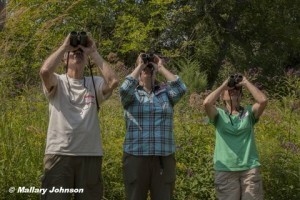 I had invited nature-loving friends to enjoy my native plants and discover the creatures they support. Edie explaining the wonders of pollination. Photo © Mallary Johnson. Click to enlarge. Cardinal Flower, Great Blue Lobelia, and Grass-leaved Goldenrod. Photo © Mallary Johnson. Click to enlarge. Some people came for just an hour, others stayed all day. 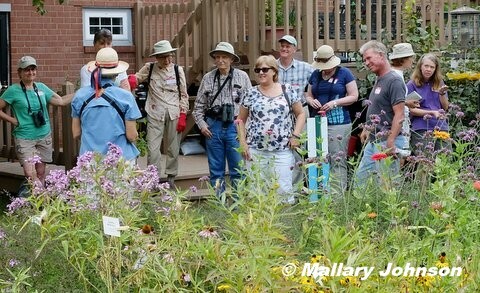 Most participated in one of the three guided yard tours. 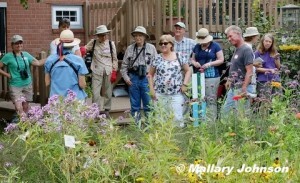 The insect and pollinator walks were popular, too. 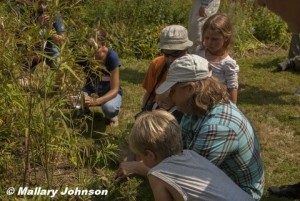 Kids enjoyed their own nature and insect events. A sizable group drove to Barb Elliot’s nearby property and saw her pond and thriving native plant habitat. Some truly nature-crazed individuals stayed after dark for moth night. Insects attracted notice and won new converts. Many admired the Monarch and Black Swallowtail caterpillars. 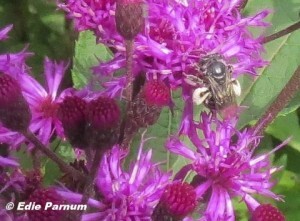 The pollinators were active on the flowers. 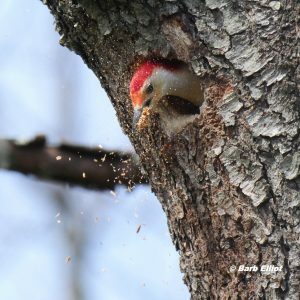 We saw native bees (European Honey bees, too), wasps, flies, beetles, day-flying moths, as well as Ruby-throated Hummingbirds spreading pollen while feeding on the nectar. Our entomologist, Dan Duran, PhD, identified a large blue-winged wasp (Scolia dubia) nectaring on mountainmint. This wasp, a parasite on the larvae of Japanese Beetles, is now a favorite of mine. The kids admire a slug with Debbie Beer. Photo @ Mallary Johnson. Click to enlarge. 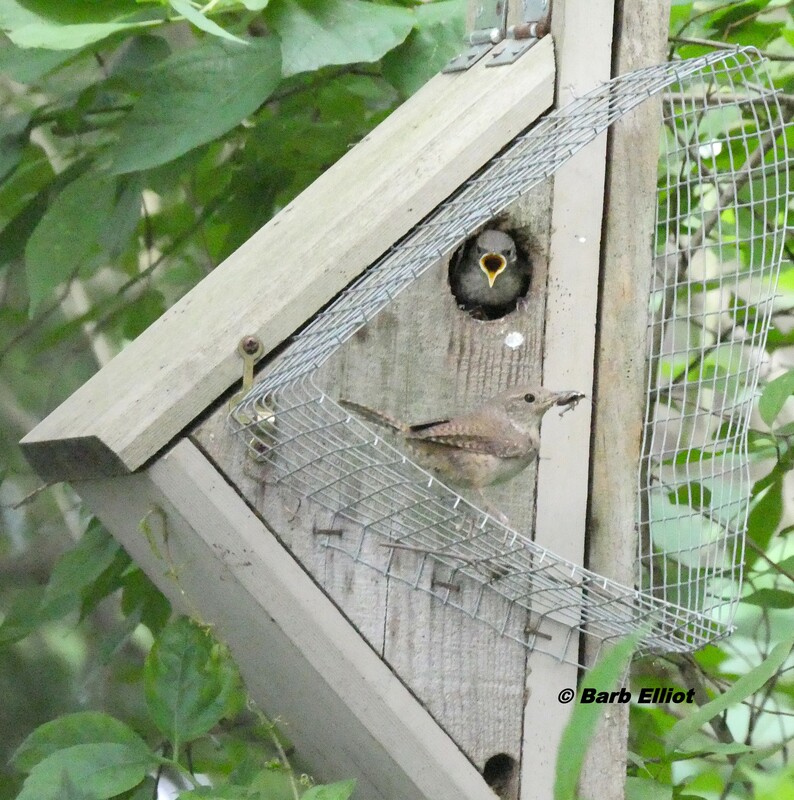 The sharp-eyed kids on Debbie Beer’s nature walk saw a migrant American Redstart. By turning over rocks and logs, they discovered slugs and other creepy-crawlies. 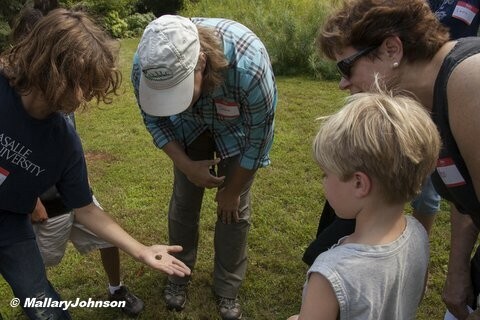 They also found spiders (the wolf spider was popular), beetles, and a cicada shell—goodies the adults missed. Vince Smith gave us a geology lesson. My property is composed of Precambrian gneiss and schist, one of the oldest soils on the planet. Because it’s well-drained, the Tulip Poplar, Black Gum, and various oaks I’ve planted will develop deep roots. They should become massive trees and provide wildlife value for decades, perhaps centuries. Hummingbird Clearwing, a day-flying sphinx moth, on Garden Phlox. Photo © Tony Nastase. Click to enlarge. 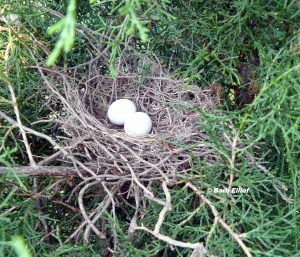 Usually I merely write about my yard’s plants and animals and post photos on the Backyards for Nature blog. However, neither words nor pictures are enough. 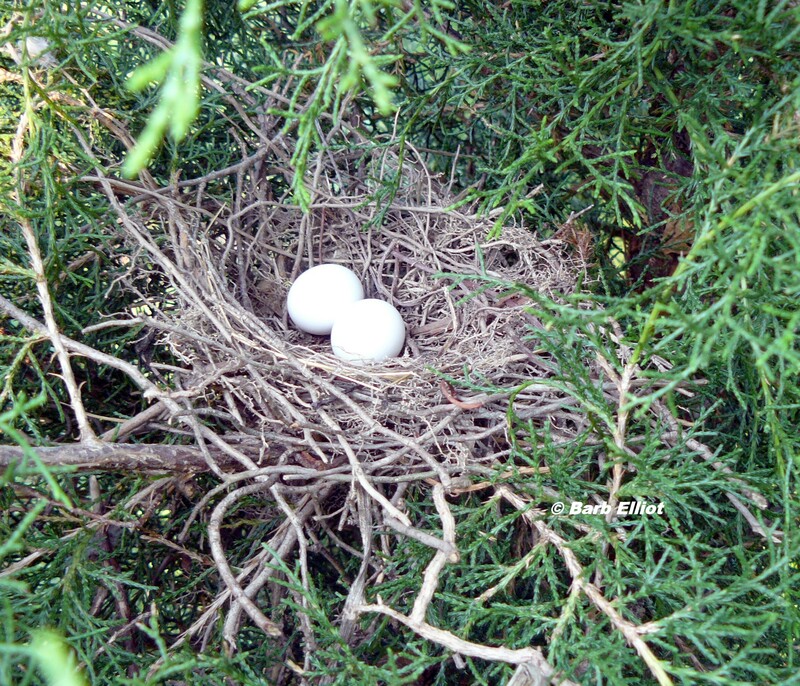 Seeing the natural beauty of my yard and discovering the creatures living there is more powerful. 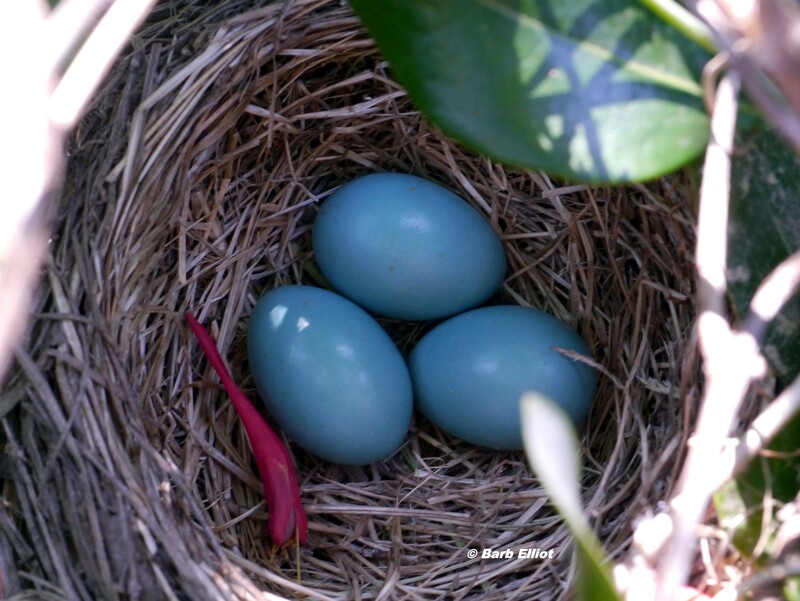 Many people told me they were inspired to create their own backyard ecosystems. Others vowed a renewed commitment to enhance their developing habitats. They said Nature Discovery Day was fun. I could see it on their smiling faces. 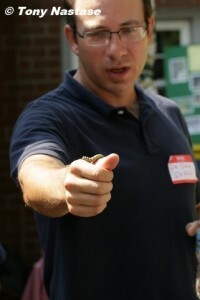 See additional Nature Discovery Day photos below. 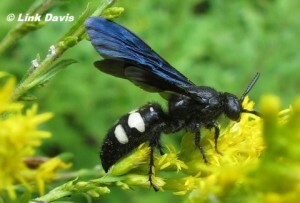 The Double-banded Scoliid Wasp, Scolia bicincta, parasitizes beetle larvae. Photo @ Link Davis. Click to enlarge. Debbie Beer and the kids explore nature in the yard. Photo © Mallary Johnson. Click to enlarge. Dan Duran shows a Monarch caterpillar. © Tony Nastase. Click to enlarge. 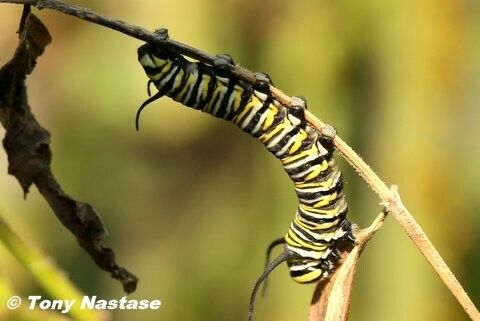 Monarch caterpillar © Tony Nastase. Click to enlarge. Edie’s shade garden. © Bonnie Witmer. Click to enlarge. 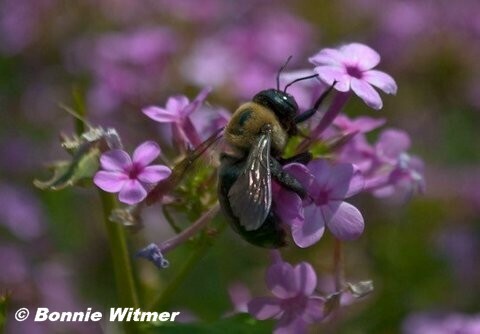 Bumble bee on Garden Phlox. © Bonnie Witmer. Click to enlarge. 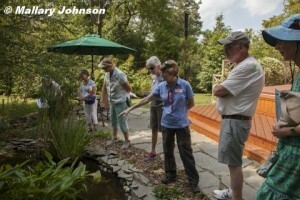 Barb Elliot describes her pond to visitors. Photo © Mallary Johnson. Click to enlarge. Eastern Redbud seed pods. © Bonnie Witmer. Click to enlarge. 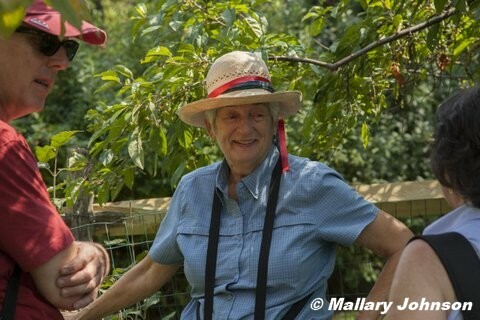 Edie talks to guests attending Nature Discovery Day. Photo © Mallary Johnson. Click to enlarge. Eastern Tiger Swallowtail. Photo © Bonnie Witmer. Click to enlarge. Vince Smith explains the geology of the property. Photo © Mallary Johnson. Click to enlarge. 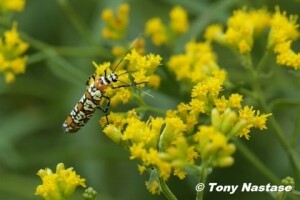 Ailanthus Webworm, a day-flying moth. © Tony Nastase. Click to enlarge. He’s found something interesting. Photo © Mallary Johnson. Click to enlarge. Bee carrying the white pollen of Upland Ironweed. Photo © Edie Parnum. Click to enlarge. Peck’s Skipper. Photo © Tony Nastase. Click to enlarge. 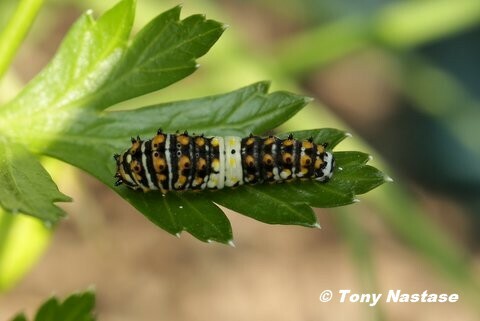 Early instar of Black Swallowtail caterpillar. Photo © Tony Nastase. Click to enlarge. Watching birds in the yard. Photo © Mallary Johnson. Click to enlarge. Monarch newly emerged and ready for release. 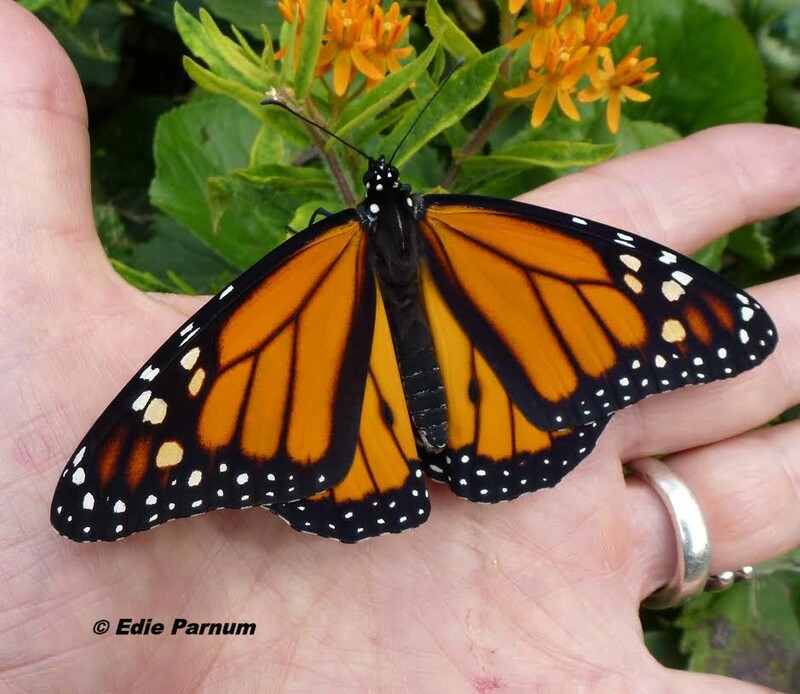 Raised from eggs laid on Edie’s Butterfly Milkweed. © Edie Parnum. Click to enlarge. 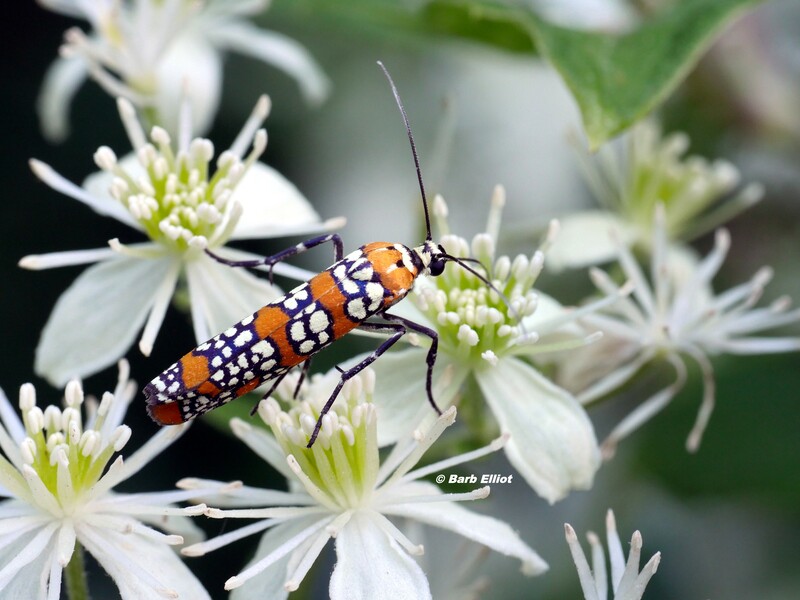 beetles, bees, wasps, flies, and more – creatures she loves – living among her native plants. It wasn’t always this way. I saw the yard when Edie moved to this ¾-acre property in 2007. It was mostly turf grass. Except for a few native trees (Black Cherry, Red Maple, White Pine), no native plants grew here. 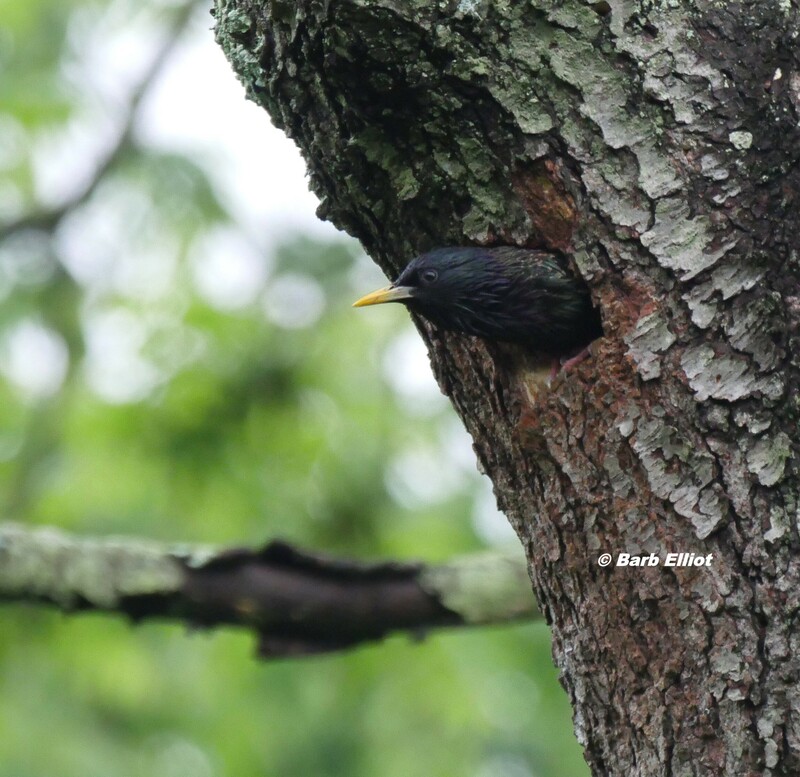 Consequently, we observed few birds—just an occasional robin or starling—no other wildlife. 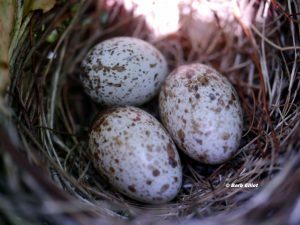 She knew she could transform her lifeless property into a healthy habitat for wildlife by reducing the lawn and planting native plants. It could become a place where she could discover, learn, and enjoy nature. 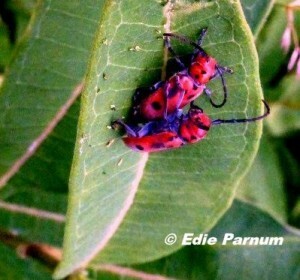 Red Milkweed Beetles eat plants in the milkweed family. 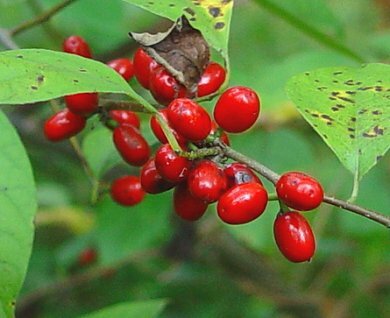 The beetles are protected by the milkweed’s toxins and the black and red colors. © Edie Parnum. click to enlarge. level perennials, vines, ferns, sedges, and grasses, are profuse. 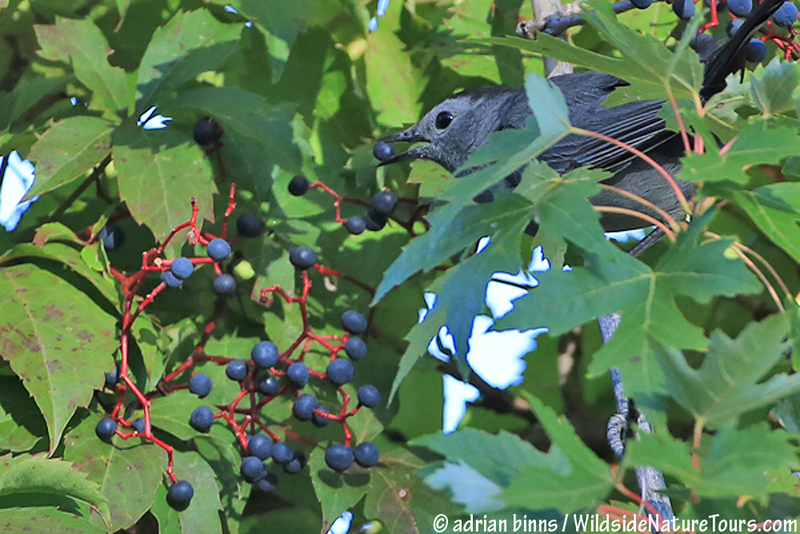 This diversity of plants offer nuts, seeds, berries, nectar, and pollen. Even the foliage of the native plants is indirectly a source of food. Insects eat the leaves and become food for birds and other creatures. Chickadees can locate the 6, 000-plus caterpillars required to feed their young. Of course, no pesticides are ever used. Trumpet Honeysuckle, a well-behaved vine with hummingbird-attracting red tubular flowers. © Edie Parnum. Click to enlarge. often locate their insect delicacies in the brush pile. 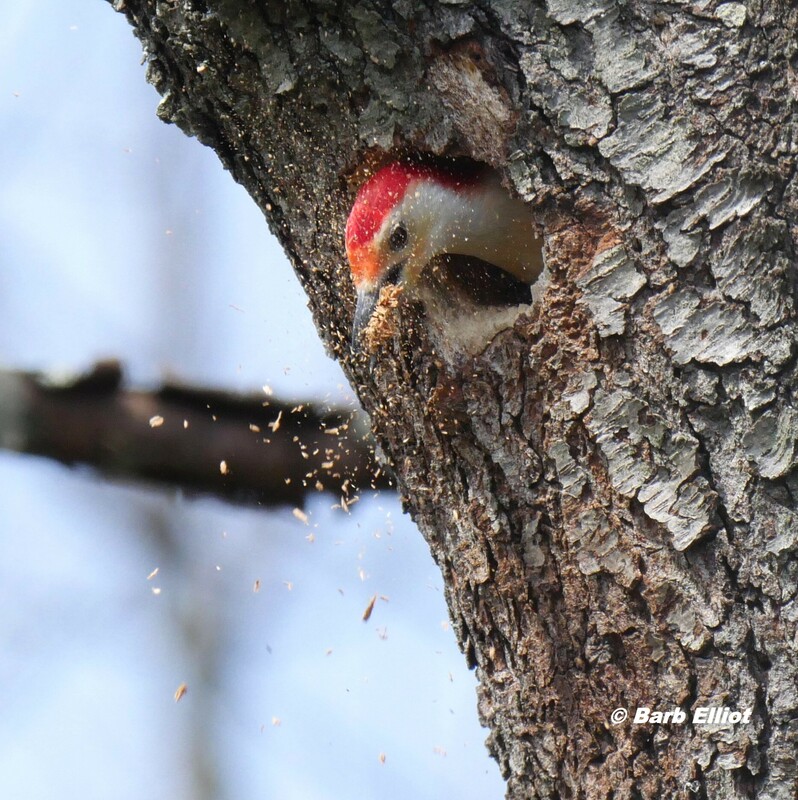 On a snag (dead tree) woodpeckers, including a Pileated Woodpecker, forage for insects in the decaying wood. A Trumpet Vine grows on this snag and attracts hummingbirds seeking nectar from its flowers. A bird bath and small pond offer birds water. The bird feeders supply a small proportion of food needed by some of the birds. 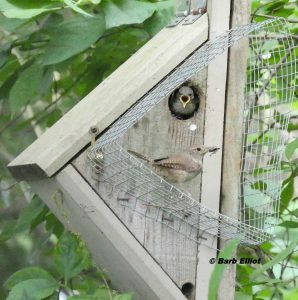 Many, many birds (106 species) love this yard. 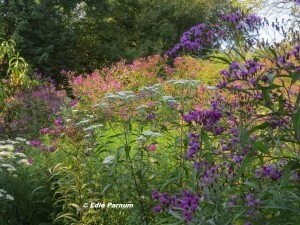 Edie’s Meadow in late summer. 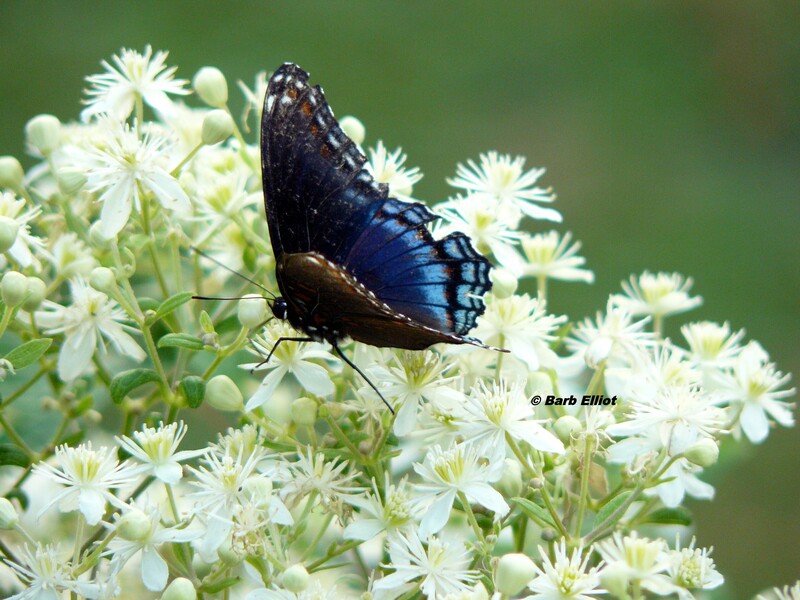 Flowers attract butterflies, moths, and other insect pollinators. © Edie Parnum. Click to enlarge. blooming from April through October. Even at night the meadow is alive with moths, beetles, and other insects and spiders. Aiming a flashlight into the dense meadow plants, she can see the tiny, shining eyes of moths and other insects. Bumble bees, too, sleep on the flower heads, resting for the next day’s work. Spicebush Swallowtail caterpillar on Sassafras, one of its host plants.© Edie Parnum. Click to enlarge. better, she loves to discover a caterpillar eating leaves. When she locates other tiny creatures—bees, beetles, wasps, and others—she takes their photos. At night she uses lights to attract moths. She photographs these creatures, too. Using the photos of insects, she can usually make identifications and then figure out their role in this ecosystem. What plants do they depend on? What plants depend on them? What do they eat? Who eats them? Are they parasites? Predators? The possibilities for discovery are endless. Mostly, she revels in success of the healthy ecosystem she has created. 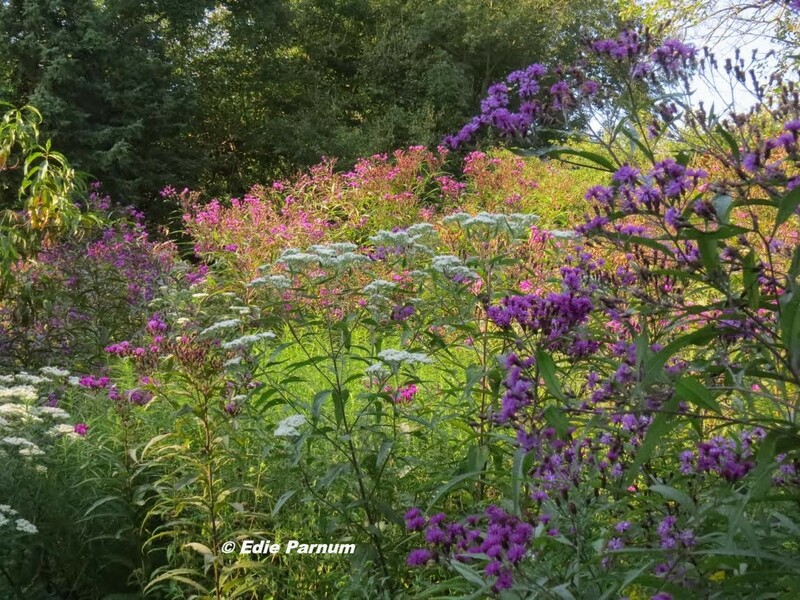 Edie enjoys showing her garden with its native plants, birds, butterflies, moths and other creatures to nature-loving friends. On August 29th she will host Nature Discovery Day. Throughout the day you can explore her yard, discover nature in action, and learn about habitat gardening. Guided walks for children and adults will be offered, too. In the evening it’ll be Moth Night. This event will be for a limited audience by invitation only. She’s inviting Backyards for Nature blog readers and their interested family and friends. Save the date and watch for an invitation coming to you in late July or early August. Each year we select two native plants with exceptional ability to support wildlife. 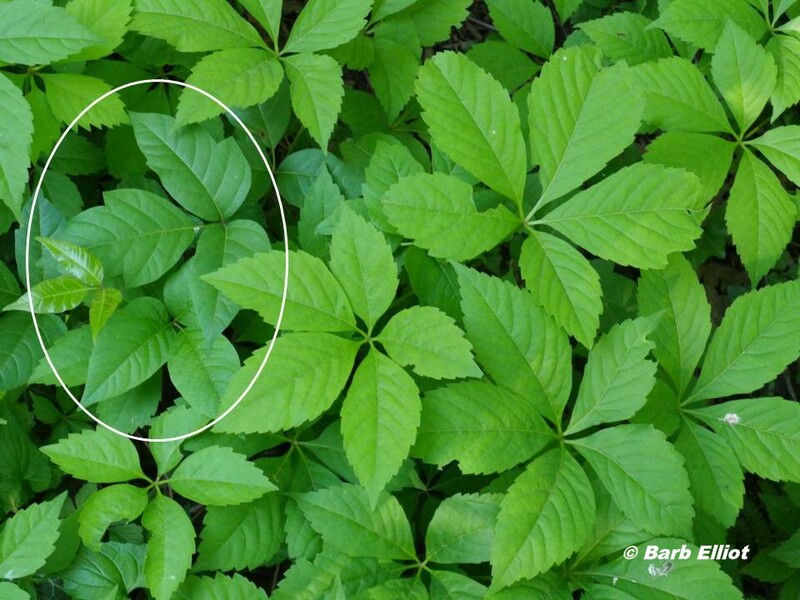 These plants will contribute significantly to the web of life in your yard. They host insects, offer nectar and pollen, and produce fruits, seeds, or nuts. 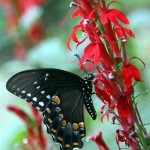 Birds, butterflies, and other insects and animals will feed and prosper. 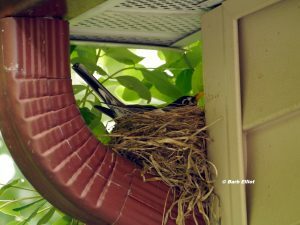 Most provide shelter and nesting places, too. 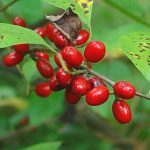 Our selections, all native to southeastern Pennsylvania, are easy to grow and readily available at native plant nurseries or native plant sales. Our Prime Plants make attractive additions to your landscape. We offer awards in two categories: Trees and Shrubs and Perennials. 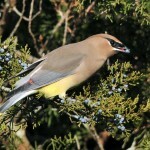 Cedar Waxwing Eating Cedar Cones. Photo © Howard Eskin. Click to enlarge. 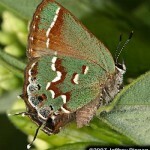 Juniper Hairstreak. Photo courtesy of Jeffrey Pippen. Click to enlarge. birds use the dense foliage for nesting places and shelter. 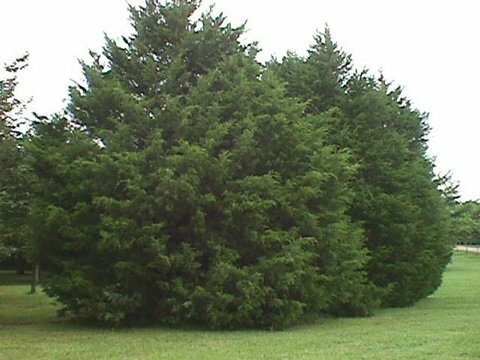 Don’t be tempted to buy the similar-looking Leyland Cypress, a non-native that offers little for wildlife. Growing Conditions: The Eastern Red Cedar tolerates a wide variety of soils and dry to moist growing conditions. It prefers a sunny spot. These trees are either male or female. 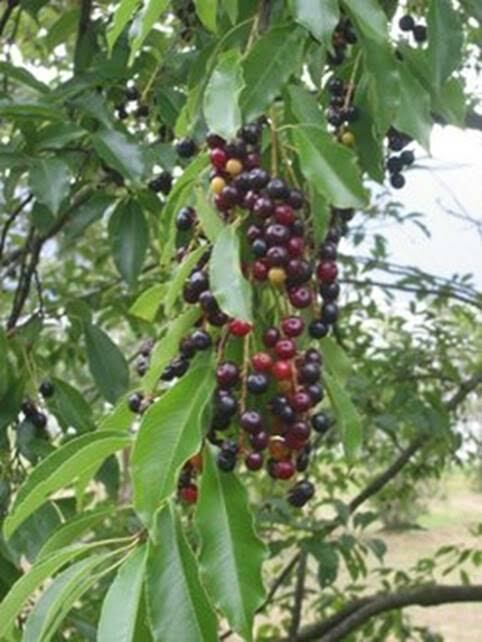 Only the female trees produce fruits, but you’ll also need a male for pollination. 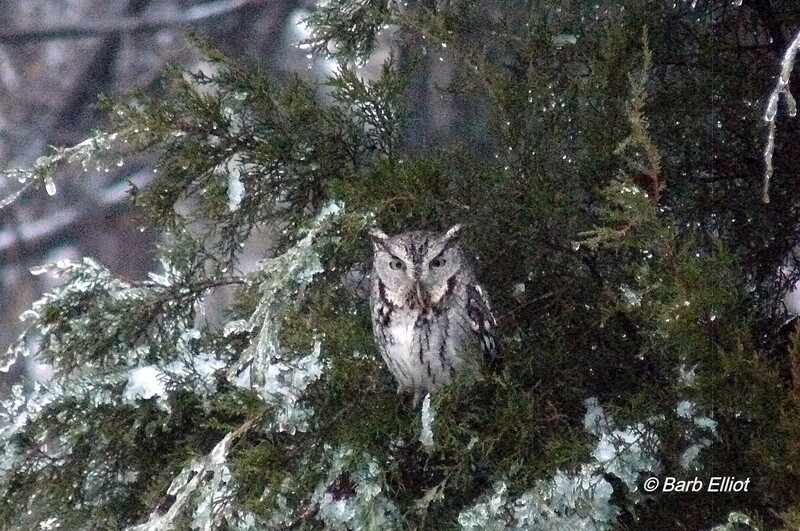 Screech Owl in Barb’s Eastern Red Cedar. Photo © Barb Elliot. Click to enlarge. By planting at least three of these trees, you will enhance their wildlife value. A row of cedars will provide dense shelter for birds. 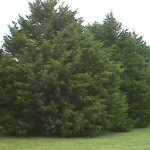 From the human perspective, the cedars can offer privacy. If planted on the north side of your house, they will create a windscreen. 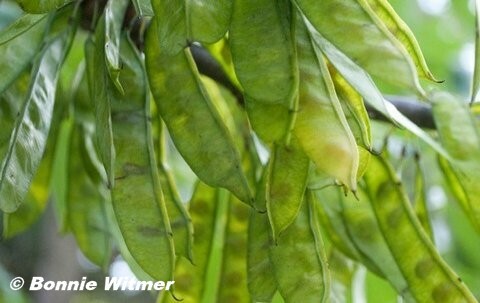 Appearance: This evergreen has a pleasing conical shape. It grows at a moderate rate (1-2 feet per year) and reaches 15-40 feet at maturity. 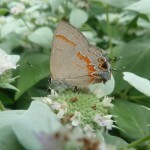 Red-banded Hairstreak nectaring on Mountain Mint. Photo © Edie Parnum. Click to enlarge. 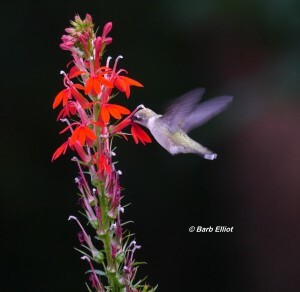 flowers over a long period of time, it may host thousands of visits by pollinators each season. With this plant in your yard, you can introduce children to pollination and teach them not to be afraid of bees and wasps. Growing Conditions: Mountain Mint is a tough plant and will grow well in dry to moist soil in full to part-sun. Like other members of the mint family, it spreads but can easily be controlled, especially early in the growing season. 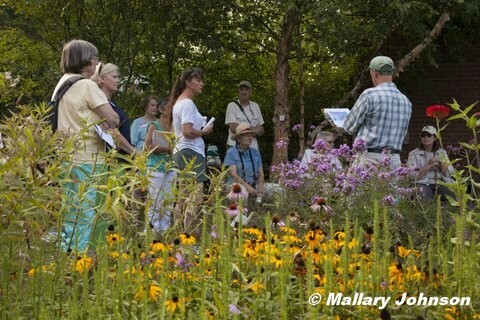 It’s easy to transplant and share with other native plant gardeners. 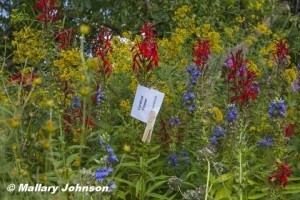 This perennial is deer-resistant, too. 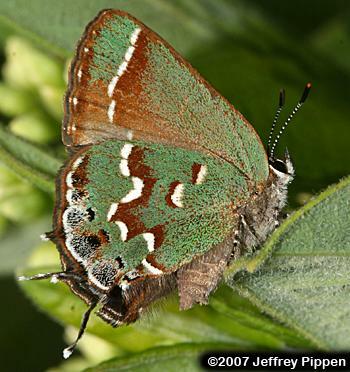 Appearance: Mountain Mint grows to about 3-feet tall. Although the numerous flowers are small and inconspicuous, the foliage is an attractive silvery grey. 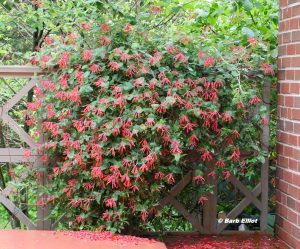 The leaves complement other brightly colored flowers in the garden and in flower arrangements, too. 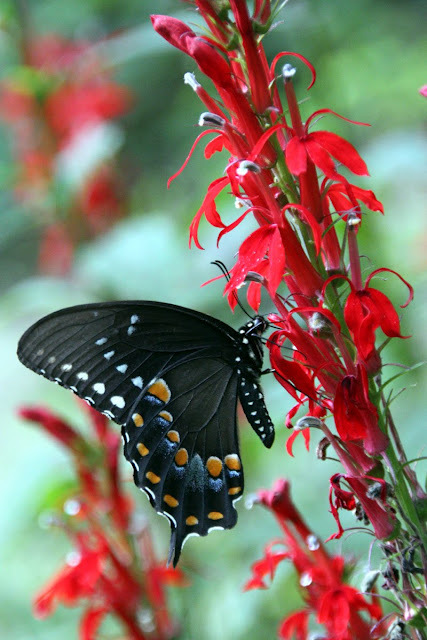 This plant’s attractiveness is enhanced by the beautiful butterflies and other pollinating insects that visit. Video © Barb Elliot. 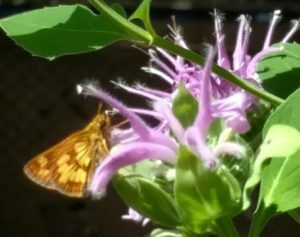 Pollinators visiting Short-toothed Mountain Mint. To see pollinator activity, click on symbol in lower right for full-screen view. Then click play symbol in lower left. May take several seconds to load. Turn on speakers for audio. Plant these and other Backyards for Nature Prime Plants, and nature will flourish abundantly in your yard.